My tenth stadium of 2013 was on Wednesday 3rd April 2013 at Mile End Stadium in Mile End, London. The match was Sporting Bengal United vs. London Bari in the Essex Senior League. Mile End Stadium is part of a sports complex in Mile End Park in the east end of London. It is in walking distance of several tube stations with the closest of these being Mile End which is around half a mile from the ground. 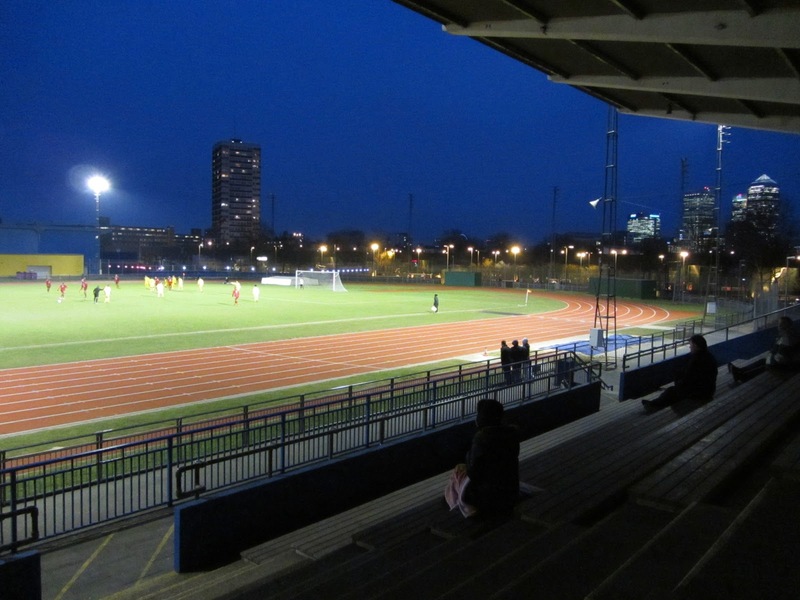 The venue is home to two Essex Senior League clubs - Sporting Bengal United and Tower Hamlets FC. 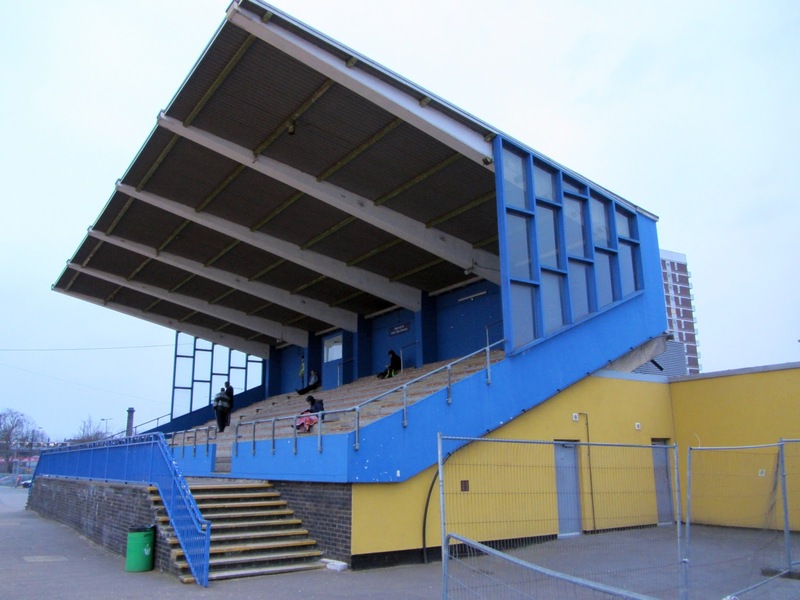 Built in the 1950s as the King George V Stadium the stadium was re-opened as Mile End Stadium in 1990. 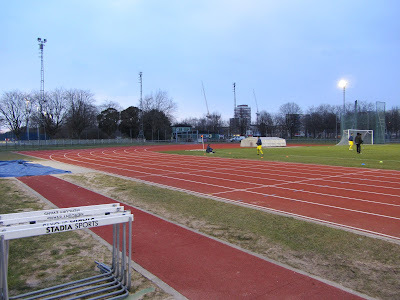 The ground is an athletics venue with a running track around the outside of the pitch. There is one covered stand which sits level with the half-way line on the eastern side of the ground. Behind this is the reception area which doubles as the entrance for fans and the dressing rooms. On the eastern side of the stadium is the recently renovated leisure centre and there are basketball court and astroturf football pitches dotted around the rest of the complex. For football games at the venue, aside from the western stand, the venue is uncovered standing behind the fencing which surrounds the athletics track. This means you can be quite a way from the action, particularly if viewing behind either of the two goals. The game consisted of a low quality opening half-hour during which neither team registered a shot on target. The visiting side came closest to scoring during this period when the ball was crossed into the box only for the ball to be blazed well over the bar from the attacker from a few yards out. When the first effort on target did come after 30 minutes it resulted in a goal and it was the home side who got it. A free-kick went through the London Bari defence and the ball landed at the feet on an unmarked Sporting Bengal forward who poked the ball past the goalkeeper to make it 1-0. The hosts netted a second goal just after the half-time break to double the lead. Some nice build-up play from Sporting Bengal culminated with the ball being laid off to the attacker who had snuck down the right wing unnoticed and he neatly clipped the ball past the advancing goalkeeper. After this the home side played some decent football and controlled the game fairly comfortably against a London Bari side who from this point on did not look likely to get anything out of the game. The match ended in a 2-0 win for Sporting Bengal United and it was a deserved victory for the home side.